Thursday July 31st 1884. We had a large washing done today. I sewed on my dress all the afternoon and ironed two hours after supper. We heard from the folks. I wrote another page to my long letter of last night. Friday August 1st 1884. I got the ironing finished, my satin dress done and a lawn one for May made. We had no letters from the folks today. Sunday August 2nd 1884. I was to town all the forenoon, got me a new silk dress Mother and Lee went to the valley in the afternoon. I was sewing some for Edith after doing a little washing, letters from the folks report Rob much better. We had a bad storm early in the night. I wrote the folks in the afternoon. Sunday August 3rd 1884. 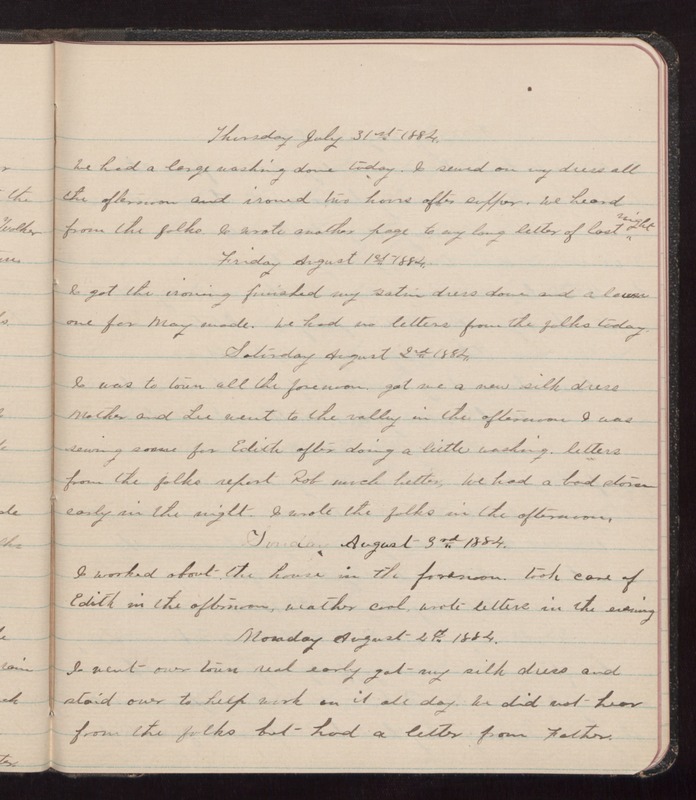 I worked about the house in the forenoon, took care of Edith in the afternoon, weather cool, wrote letters in the evening Monday August 4th 1884. I went over town real early got my silk dress and staid over to help work on it all day. We did not hear from the folks but had a letter from Father.